Primo Stainless Steel Side Tables for Oval Extra Large and Kamado Ceramic Barbecue Grills give you extra spots to work with all of your food and grilling tools without taking up a ton of space. This pair of stainless steel side tables attach to the Primo cradle for your Primo ceramic grill. They extend outwards on either side of the main grill area, and when not in use they can be folded to the grill's sides to really keep the grill's 'footprint' as small as possible. 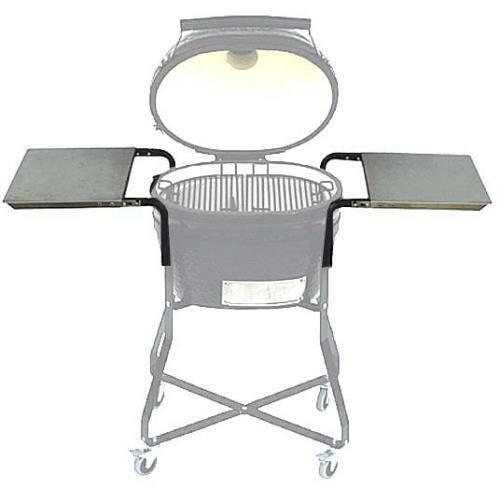 If you get a cradle and want to find new ways to utilize your Primo ceramic grill, the Primo Stainless Steel Side Tables for Oval Extra Large and Kamado Ceramic Barbecue Grills is the perfect option. Please Note* This set of shelves must be used with a Primo cradle for Primo ceramic grills. The shelves DO NOT attach directly to the grill. WARNING: Burning charcoal in this product can expose you to checmicals including carbon monoxide which is know by the State of California to cause birth defects or reproductive harm. For more information go to www.P65Warnings.ca.gov.